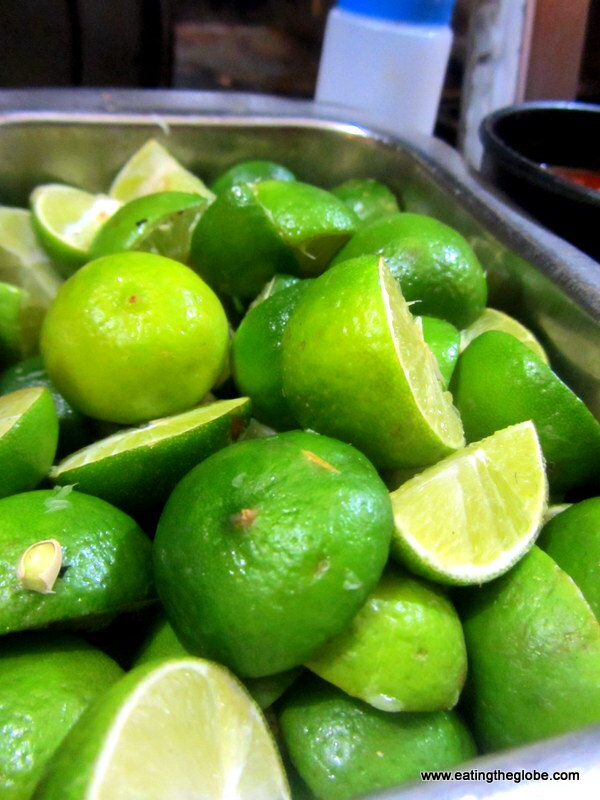 Andy’s taco cart in San Miguel de Allende, Mexico, isn’t just the best taco cart in San Miguel de Allende. It happens to be one of the best taco carts anywhere. The aroma from the sizzling meat reaches your nose long before you ever get to the cart. And cabs literally block the street while the drivers jump out to grab their tacos. The pastor at Andy’s is the best pastor that I’ve ever had. This is pastor. And you would have that same smile on your face if you got to be around it every night!! If you don’t know what pastor is, my guess is a Lebanese girl hooked up with a Mexican man, and this was their offspring. 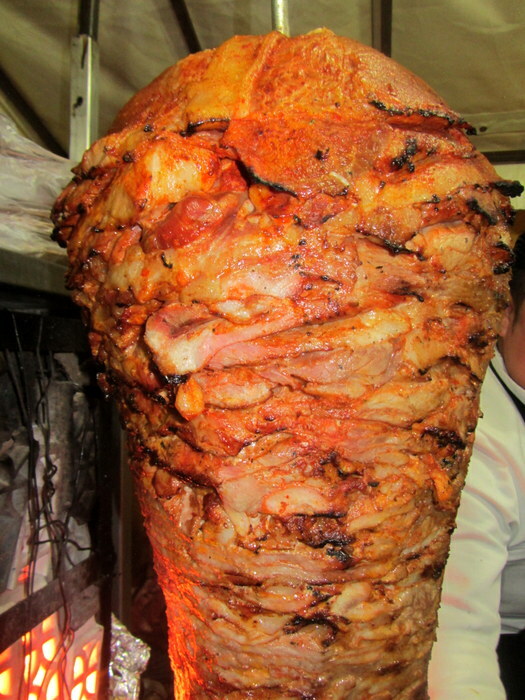 It looks like shawarma meat, but instead of lamb, it’s made from pork. Now, I don’t know about you, but lamb and pork are my two favorite meats, so give me either one, and I’m happy. The meat is marinated in spices and pineapple. It roasts on a spit with pineapple on top, and they cut a piece of the pineapple and serve that with the pork on your taco. Yeah, I know! Why aren’t you here? I live 67 steps from this place (yep, I’ve counted). It’s the #1 thing I will miss about San Miguel. Well, that, and my friends. But, you know what they say about friends. They come and go. But this pastor. This pastor is the most perfect food you can eat in any situation. You could, but the cart doesn’t even appear until sunset, the only downfall of this place. This would be what I would eat for breakfast if I could. Seriously, it’s the only meat I’ve found that is better than bacon. Besides tacos, Andy’s also serves gringas. I’m not sure why they are called that except that it seems that white people really like to eat them. I like to eat them because they are bigger. They come in a flour tortilla instead of a corn one and come with lots of melty Oaxacan cheese in them. I seriously don’t know what I’m going to do when Andy’s closes and I can’t walk 67 steps to get them. What If I Don’t Eat Pork? Andy’s also serves bistec and chorizo. The best thing is you always get a heaping pile of onions with your tacos. Well, I shouldn’t say always because somehow in the picture above, it didn’t come with my onions. But, normally, you get onions. And amazing salsas, red and green. The service is great. Andy and his crew always greet me with a hug. Sometimes, I’m lucky and there is a stool available at the cart and I feel like I’m in my very own Cheers episode. Seriously, I’m gonna miss Andy’s most of all. Andy’s is on Insurgentes, #85 just down the street from the Biblioteca (and 67 steps from my house) . Remember his cart doesn’t even appear on the street until sunset, so don’t look for it earlier than that. On the bright side (or maybe the dark side) depending on how you look at it, he’s open until 3 in the morning! And no one cares if you show up in your pajamas. 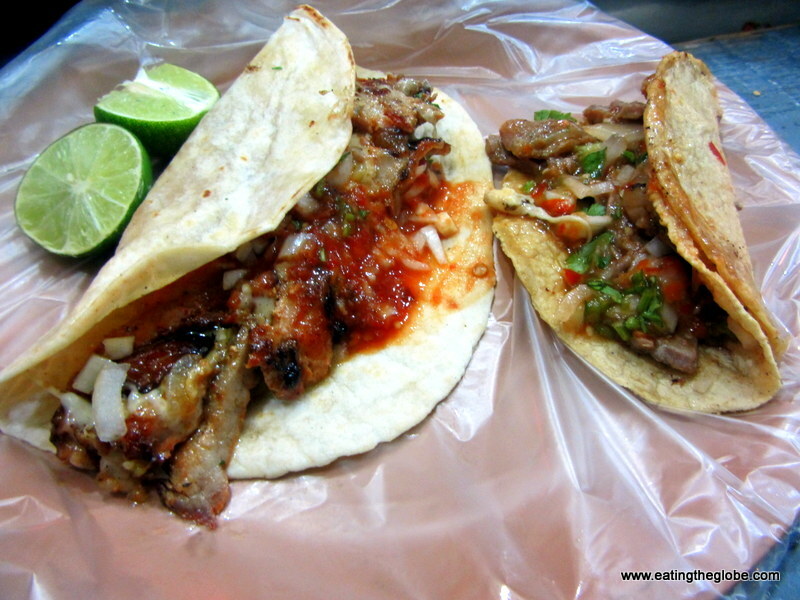 13 Responses to "Andy’s Pastor Taco Cart In San Miguel de Allende, Mexico"
LOVE his gringas….Alfredo turned me on to them! Droooool… Pastor is my favorite! It’s so damned good, especially when done right and it looks like Andy is doing it right. I see he has the charcoal set up, which is key, too many pastor wanna-be’s out there are using gas flames. Yes, Andy knows what he is doing…and I agree with you, it’s just disappointing when it’s not done right. Wow!!!! We could so live on just this! Gotta go out and find some food now… bye. The GypsyNesters recently posted…What if My Adult Child is Addicted to Online Gaming? After reading the raves I had to hunt down Andy’s cart, it only comes out late at nite, once it gets dark so many times I missed him. I found him first setting up, he is all business and no nonsense, low points on personality, he shouts out how many over and over, with a bravado that tells you he knows he is the bomb. I think the fame is going to his head. 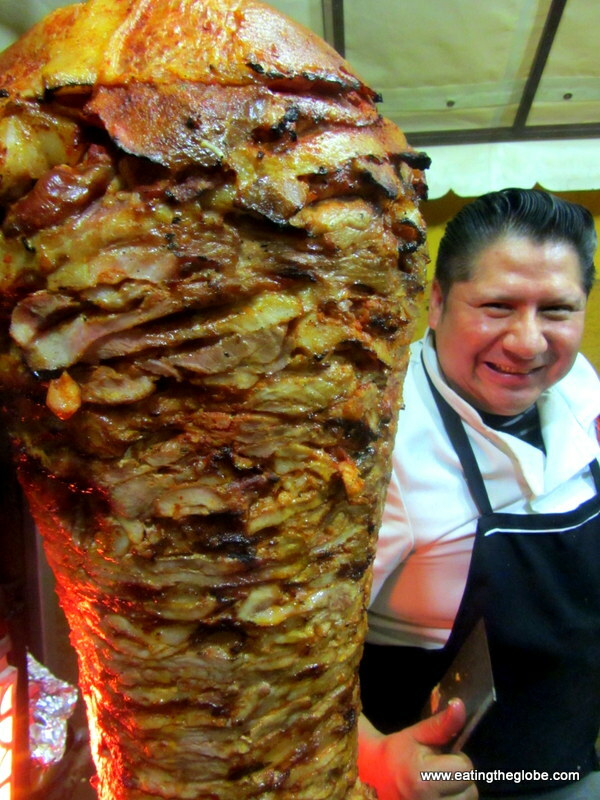 I order the al pastor with Pina, it arrived without and it was good but not great, perhaps because the pineapple was missing or perhaps because he just set up so the pork had not been simmering. I then ordered the gringa, also good but not great. I must say I was a little turned off by his demenour and arrogance, but I can see the appeal..also likely better after a few drinks. I am sorry to hear that you had a bad experience. Are you sure you had the pastor because pastor doesn’t simmer? Where is your favorite taco cart in SMA? Awesome, I’m gonna check this restaurant out when I visit San Miguel de Allende. I love Mexican food but never tried this. MarkDeafMcGuire recently posted…What are hearing braids? We are taking notes on all your favorite places in SMA and will try them all when we go there for six weeks this winter. We’ll be in Ubud in October, and would appreciate any additional suggestions. Hi Peggy! Have so much fun. My article on Ubud restaurants is at http://www.yourownlife.org/9-best-restaurants-ubud-bali/. My very favorite place there is Clear Cafe. It’s not in the article b/c it had burned down when I wrote this, but I understand it’s reopened now. Happy travels!! Thank you very much for the information, my friend.